Marina Tower is built over 5 acres of a freehold stretch in Tanjung Bunga area. It is the earlier development of the Ratu Mutiara residential scheme. The premise itself is nestled within a well-landscape environment. Marina Tower hillside condominiums are distinctively designed and combines the best of luxury living and modern-day convenience. Marina Tower consists of 204 standard condominium units ranging from approximately 1,090 to 1,350sq.ft. and 8 units of exclusive penthouse units of over 2,000sq.ft.. Each unit offers a spectacular view of the beautiful ssea in the distance. 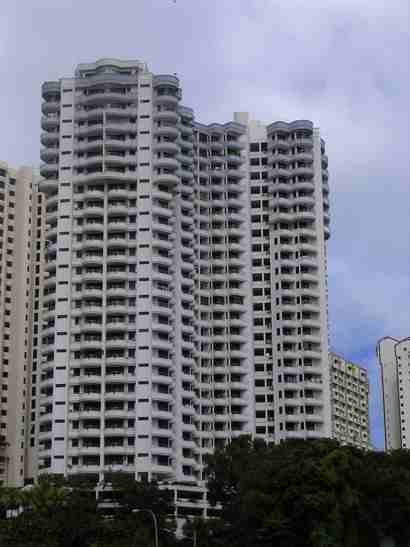 The neighbourhood condominium blocks are Twin Towers and Desa Mar Vista. Built-up Area : approx. 1,090 - 1,350sq.ft. 24-Hours security, covered car park, landscape garden, management office, community hall, convenience store, swimming pool, SPA pool, wading pool, gymnasium, sauna, table tennis room, BBQ-pit, intercom system.